Goni bai, a woman from the Gond tribe in Madhya Pradesh, became a widow last year. Her 35-year-old husband, Lakhan, died of an unknown illness. The family was already in debt and Lakhan’s sudden death came as a blow to his wife as she had no means to repay the medical arrears. It was in this time of crisis that a community-run insurance programme came to her rescue. The cooperative effort is an initiative of nearly 7,500 women from villages across Panna district in the state. Most of them are members of various self-help groups (SHGs), although a non-SHG member can also be a part of this initiative. The project, which started informally in 2011, provides insurance of Rs 15,000 on submission of an annual premium of Rs 300. In November 2013, the women registered under the non-profit, Saksham Mahila Samuday Kalyan Mandal (literally, community welfare fund of capable women), which lends money to its members to meet emergency expenses. Goni Bai was entitled to the benefit as her ailing mother-in-law is an SHG member. She got Rs 5,000 the day her husband died and received the remaining amount in 10 days. She used the money to settle her debt and pay the medical expenses. In the first two years, 86 insurance claims were settled under this project. Although the insurance can be availed by both husband and wife for a premium of Rs 150 each, the initiative is aimed at empowering women. Thus, a widow can claim the money, but a widower cannot. A married member can claim it for herself and her husband, but a man cannot claim insurance if his wife’s membership of the non-profit ceases at her death. 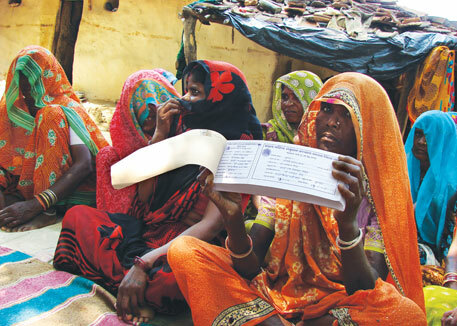 What makes this initiative unique is the fact that beneficiaries can get emergency funds immediately, without any paper work, says Anil Namdeo, a state government official who facilitates micro-finance to SHGs through the District Poverty Initiative Programme, a poverty-alleviation project of the state. In the event of a death, usually of the bread-earner in the family, members of the non-profit are informed by word of mouth. One of them approaches the beneficiary and gives her Rs 5,000 either on the same day or the next. The remaining amount is disbursed within 10-15 days after a district committee meeting of the non-profit. Chaired by 26 members, the committee holds a fortnightly meeting where they review the claims pending settlement. They discuss when and how the remaining amount should be transferred to the beneficiary and also check whether the beneficiary has deposited the premium. In case of any anomaly, the beneficiary’s membership is cancelled. The project has become more popular than the much-publicised Pradhan Mantri Jan Dhan Yojana. The Union government’s financial inclusion plan was launched in August last year with the purpose of connecting every rural family with the banking sector. But many people, like Goni Bai, have not heard about it. She is also not familiar with the state government’s insurance scheme, Aam Aadmi Bima Yojana, for families below the poverty line, under which, the state claims, 8 million families have benefited so far. There is no data or study on the government’s performance. “I have not heard about any of the government insurance schemes. I only know about our community initiative,” Goni Bai says. The idea of community insurance evolved in 2011 after the death of Ramesh Bai. She had helped form more than 50 SHGs in her village, Kherwa, and other neighbouring villages in Panna district. These include Sirsawaha, Dharampur, Gurha, Pali and Matlipeta villages. Her tips and training to women on micro-savings made her a popular SHG volunteer in her community. But her life was cut short at 40. Ramesh Bai was expecting her sixth child. There was no basic healthcare facility in her village or in the nearby panchayats. When she went into labour, she was taken to the Panna district hospital, where she was referred to a private hospital in Satana district, 80 kilometres away. The doctors declared her dead on arrival. “The hospital demanded Rs 5,000 to give us her body, and that was all we had. Since we had no money left to arrange for a car, her body was stranded on the roadside,” says her husband, Malakha Gond. The disgrace with which Ramesh Bai was treated outraged the women. “Her death was a big loss to the SHG movement and it humiliated all its members,” says S B Singh Baghel, project facilitator and team coordinator, National Rural Livelihood Mission. The incident sparked a discussion among the women in SHGs in Kherwa and neighbouring villages, who came together to help each other financially in times of crisis. “We decided to keep aside some money out of our savings to help women in difficult times,” explains Maya Kumari, an SHG member from Kherwa. After consultations with insurance agents and local government officials, the women struck on the idea of a “risk management fund”. “An account was opened at Regional Rural Bank in Panna and the amount collected from the initial premium was deposited,” Namdeo says. 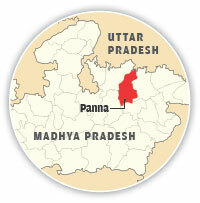 “In 2012, nearly 1,000 women across Panna came forward to be a part of the initiative. By October 2014, the number increased to 7,000,” says Rajkumari Yadav, president of the non-profit. The initiative has struck a chord with the people. “I did not trust the project at first as I had once been cheated by a non-banking firm. But when I saw two families in my village getting the benefits, I asked my wife to join the initiative,” says Bhagwan Ram, a resident of Bhagoha village in Panna. The women, however, feel the initiative has to be more organised in terms of documentation. “Our members are spread over 339 villages in Panna, but other districts also want to join. As the scope is expanding, there is need for more staff who can look after the renewal of the insurance policy and collection of premium,” Yadav says. Since last year, the non-profit has also lent money to a local farmers’ federation named Karnavati Agri-Producer Company Limited, a seed-making venture started in 2006. The amount to be lent is used from the premium and the interest charged is lower than that of the banks. While the federation got a loan of Rs 5 lakh, the non-profit has got Rs 1 lakh as interest so far. “We settled six insurance claims with this money,” beams Yadav.